In my previous post I gave a long list of what clients would usually say to me during our first encounter, so I think I need to follow-up with how I tried to deal with those all awkward meetings. Most of the time I tried not to sit there like a deer staring into an oncoming traffic. As a foreigner in Tokyo there is a 100% chance you will be asked of be asked silly and/or uncomfortable questions in an unimaginable number of scenarios. How you react to the situation is, however, something you will have control over. 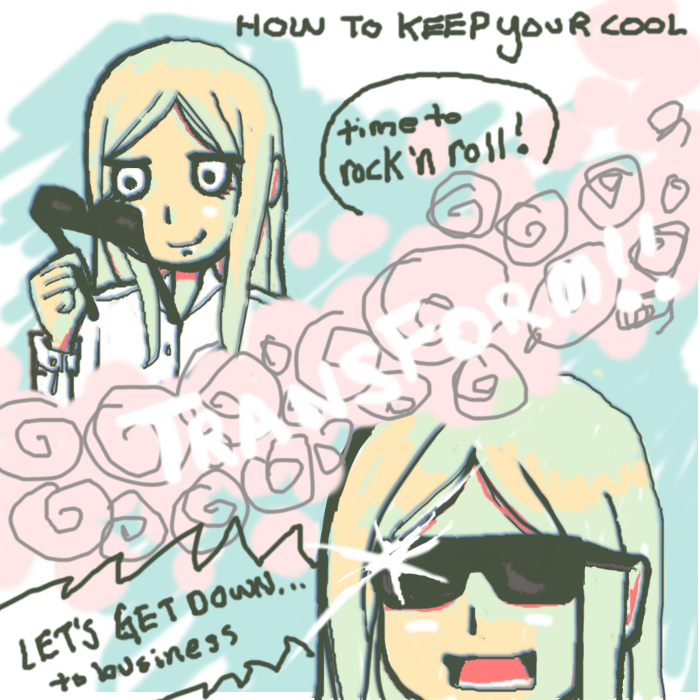 I said before that you have to keep your cool to stay ahead, as cheesy as it sounds. It’s insanely easy to become a “rage filled gaijin” in only a few short months of working. Play the long game. These first few meetings are critical when you are establishing your footing. It’s kind of like putting on figurative sunglasses, and when I go into cool mode I pretend I’m a magical girl transforming into a justice warrior. Don’t judge. If you are struggling during a meeting, do NOT be completely passive and let people walk all over you. You are allowed to tactfully assert yourself. I’ve dealt with countless uncomfortable meetings during my first couple of months in sales, but everything started coming together when I learned how to steer the conversation towards a mutually comfortable topic. Take it to where you want it to go and own it. 1. If they keep asking you where you are from and about English or Japanese, then try to counter that question by asking about their own international experiences. If the person was hard to read, I would sometimes ask them, in a pleasant tone, about their level of interaction with international clients/companies. Trying to find out their opinion about the Japan market was a good way to do this too. “Well in America, people use this technology. I know in Japan that technology is on the rise, but do you think it will grow much this year?” Maybe half the time we could have a normal, progressive conversation, and it would end on a positive note. A lot of these guys get really excited talking about up industry trends, and if you can nerd out together about industry topics, then the rest of the meeting tends to go better. 2. If you seem to be the same age or have the same amount industry experience, then use that to break the ice and get them to open up. Normally if the person you are talking to realises that you are both in the same boat in one way or the other, they will drop their guard a bit. Sometimes it seemed that they thought I was some sort of international specialist, when it was more than likely we were working with a similar knowledge base and experience level. If they feel less intimated, then the conversation becomes more natural. You go from the scary gaijin to a less scary commiserator. 3. If they speak with a dialect ask them where they are from. This is probably the lowest hanging fruit, but people love to talk about their hometowns if they are from outside of Tokyo/Kanto area. If they were speaking in a bit of a Kansai dialect, for example, then I’d politely ask them if they were from Kansai, and sometimes we could break the ice by talking about Osaka or Kobe. It feels like they become more comfortable when they realise that you know a bit about the various areas of Japan. 4. If they are new to the industry, then offer them a crash course about what you know. Sometimes you will talk to people who are fresh to your industry, and you have a bit of an advantage of them experience-wise. Asking them tons of questions as explaining things usually avoided the “Oh your Japanese is so good” comment because they actually get involved in the conversation. The issue of nationality goes on the back burner. If they realise that they can actually get some useful information, then they will drop their guard and speak earnestly. 5. Make awful puns or play on words to break the ice. This is the trickiest method, but it will pay off in spades if you can make it work. Cracking puns is pretty dangerous territory, but sometimes you have to take risks in order to get ahead. It felt better talking to someone who was smiling than to a person that an easter island head grump-face. Who doesn’t love a good pun, seriously? 6. No matter how hard you try some people will not take you seriously at the meeting. If I got that vibe I’d keep the meeting short, but try to get the minimal amount of information for what they were looking to accomplish. The same day after the meeting I’d send a very polite follow-up email and attach a document that has some simple scenarios planned out for the things we talked about. I think it is the best way to try to salvage your meeting, and the email follow-up (お礼メール) is good Japanese business manners. There are people who are just more comfortable talking through email than face-to face, which is fine as long as you make progress. It’s not that daunting of a task to make some solid business relationships as long as you keep your cool and don’t take yourself too seriously. Not everyone is a jerk after you get to know them. I promise. In general I think it is safe to say you can not apply the same digital marketing strategies in Japan as you would for US and most other places. Ad creative, media, and users are just not the same. Basically, cultural and language differences caused Japan’s internet to develop in a closed-off ecosystem that does not generally correlate with Western and/or English language internet culture. Memes, jokes, site layouts…everything is just different. Mixi is an interesting piece of Japanese internet “history” that gives a bit of insight into this phenomenon. In 2004 Mixi launched an SNS platform that was accessible from a desktop and feature phone portal site. At its initial launch and high growth period services included blog publishing, member to member messaging, photo albums, community creation, and games. At one point everyone had it, and it felt like most people were active almost on a daily basis. Mixi continued to grow in popularity as an SNS until it’s peak around 2012. In recent years monthly active users have sharply decreased along with advertising revenue, and it is not the shining star that it used to be. So what caused it to peak? Why did it lose popularity? Initially you could not just join Mixi when you wanted. You would have to get an invite code from an existing user, so there was a big hurdle to overcome just to register. I remember in early 2006 when I signed up that I needed to ask a few friends for a spare code. It took about 3-4 days to register! I can understand why in the first few months why they would want to limit access (spammers, fraudulent accounts, server loads etc), but I think in the long-term it hurt their growth by having an invite system for too long. It wasn’t something you could casually join at your own convenience. At one point Mixi nixed the invite system, but you still needed a valid Japanese mobile phone number in order to sign up. I feel this was another bad move that stunted the site’s growth. 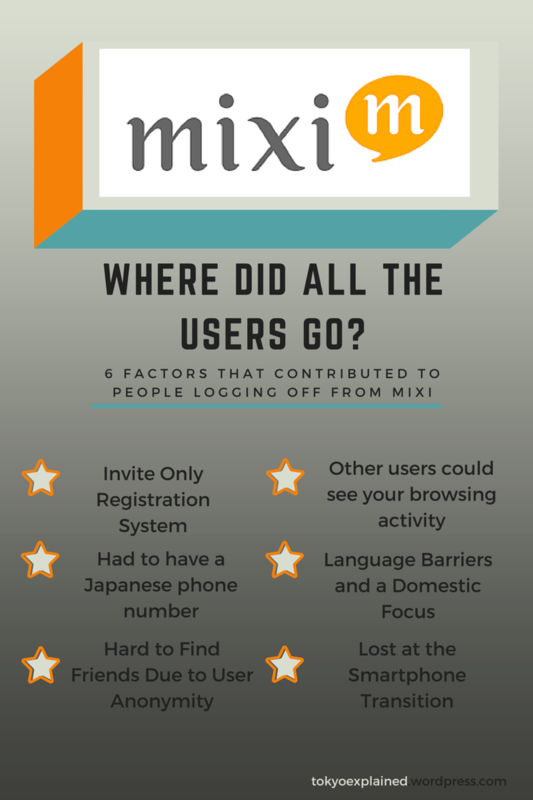 Japanese users who were overseas, for example, could not rely on Mixi in order to connect with friends. If you wanted to register a new account, you would need a new phone number. The whole sign up process was a big pain in the neck. Japanese net users value their privacy more than US Internet users. They don’t like to put their face up online, and until Facebook spread, people were very hesitant to use their real name online for any sort of activity. Mixi did not require real names or photos, so everyone was running around with a nickname or net handle of some sort. Your friend Yamada Taro could have a handle like “YamaTa” or maybe something even more hard to recognise like “（＞▽＜！！）や”, and it was really hard to keep track of which user was who if you didn’t log in for a while. Japanese people were very reserved about posting any pictures of their faces (and still are), so when a user named ぴかぴか with a picture of a chihuahua added you as a friend, you couldn’t tell if it was your best friend from middle school or some random stranger without some digging around their profile. During it’s growth period Mixi had a “foot print” feature that showed the time of when the last 100 or so users who viewed your profile page. People were hesitant to view other people’s profiles, and it was a big deal when someone you liked viewed your page.The last time I logged in the foot print function was taken down, but I think this also hurt the site in the long-run and made people self-conscious of what they were doing while on Mixi. The number of Japanese internet users reached it’s saturation point, and between the initial invite system, the phone number issue, and a resistance towards non-Japanese speaking users from existing users, the platform lost chances to gain footing overseas during key growth periods. There was also never an English version during the time it was peaked, so it reenforced the pre-existing language barrier that exists on most Japan-based sites. Mixi’s feature phone site was well designed and offered an above average user experience, but it lost traction during the initial spread of smartphones. In my opinion Facebook and Twitter apps had a better user experience. Also there was a growing acceptance of using your real name and uploading photos showing your face, users looked to other sites for social experiences. However, despite it’s struggles as a social platform in recent years, in late 2013 Mixi’s smartphone game Monster Strike helped turn the around the sluggish sales numbers. During a success download campaign, the app had about 6,000,000 users by mid-2014. Revenue-wise it is slowly evolving from a SNS to a game company. I think it is interesting how facebook got people to come out of their shells and use their real names and photos. Users are still incredibly shy when compared to Americans. It’s funny how these cultural traits still shine through to online personas despite the lack of “borders” on the sites. 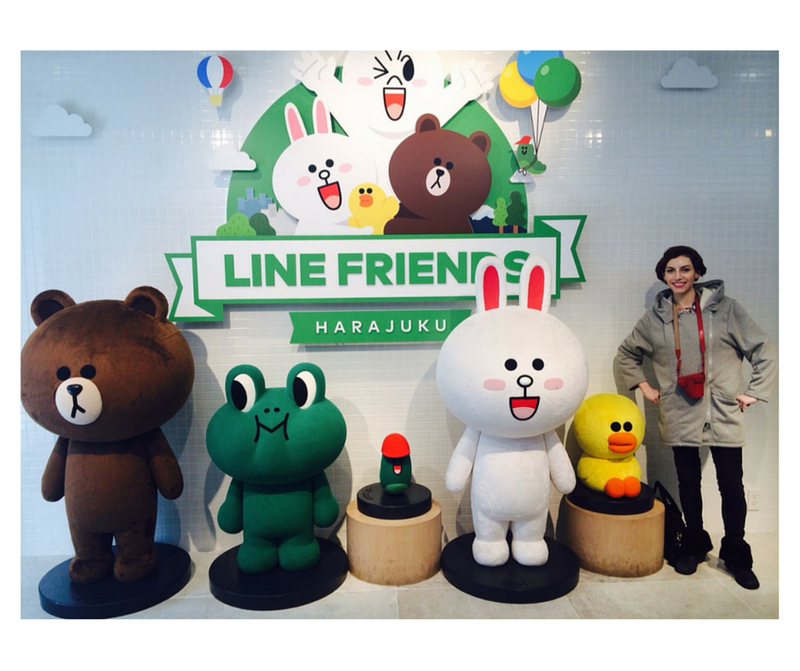 Finally got to meet with my LINE friends! LINE has taken over the way people send messages on their phones in the last couple of years. Snapchat or WhatsApp don’t really have any footing here, and as of last summer the number of users has grown to over 50 million domestically. (I work with stuff related digital marketing and all that fun stuff, so this is my bread and butter.) From chatting to job searching, LINE has a wide variety of functions for both users and small businesses to large businesses. Back in the day of feature phones, people hardly used SMS to communicate, and instead everyone used their phone’s email address to “text” friends. It was pretty tedious to chat in a group or message something quickly. However with phone number portability between carriers and the spread of smartphones, quick communication has completely changed. Back in the day when you made a new friend, you would normally ask what their mail address what, but now it is all about exchanging your LINE ids. The whole dynamic has changed in just 3-4 years. I think the genius behind LINE was how well their characters work with branding the app. Their designs are easily recongizable while still being liked by a pretty wide range of people- it’s cute but not too cute. They were part of the first set of stamps that came with the app, so from day one they have been part of the whole chatting experience. I’m the 6th LINE friend. A+++ Will go back again.